On the DVD commentary track for “My Sister, My Sitter,” co-showrunner Josh Weinstein has his two children in the recording studio. Throughout the episode, they offer their own commentary, and someone with a serious dislike of children might look at their presence as a disruption; admittedly, even as someone who likes kids, there were moments early on where I wished the commentary track could focus more on the episode’s development, and felt some of Molly and Simon’s reactions were moving us away from that goal. (I do feel bad about this, for the record, although they’re probably both teenagers now, so I think they can handle a critic’s mild, initial disappointment). But as the commentary track evolved, I realized Molly and Simon are reacting in the episode in ways that speak to its distinctiveness. It’s true that they’re not reacting to the same thing I react to on rewatching it: they don’t laugh at the Bob Seger/Bob Saget joke, for example, and they don’t point out one of my favorite lines from the episode, “Why would the ambassador do such a thing?” However, their common sense observations about the episode and its plot were a reminder that this episode is almost alarmingly simple. At its core—fittingly, given Molly and Simon’s presence—is the relationship between siblings, and about the roles siblings take on with one another that reshape the nature of that relationship. It is a strikingly observational episode, which is why Molly and Simon’s observations end up being a valuable framework for recognizing how the script credited to Dan Greaney—cited on the commentary track as the writers’ source for “real kid” writing—channels the basic humanity of this premise. The simplicity of the episode begins with the fact that it hinges on a single character trait. Lisa Simpson is responsible—she does her homework, she respects her elders, and she is way more mature than you would expect from an eight-year-old. The episode then asks a series of logical questions: What if Lisa read The Babysitting Twins—a clear riff on The Baby-Sitters Club—and got intoxicated by this formalized, monetized space for demonstrating that responsibility? What if she got the opportunity to babysit and impressed, leading to more business? And what if Marge and Homer’s basic desire to have a night out led them to put Lisa in charge of Bart and Maggie, creating an unholy experiment in which Lisa’s respectability and Bart’s mistrust of authority are pitted against one another? What I love most about these questions is that there are logical barriers in each case. Marge begins the episode incredibly skeptical about Lisa’s babysitting ambitions, showing concern during Reverend Lovejoy’s announcement and then working hard to explain to Lisa why even an eight-year-old often mistaken for a nine-year-old might not be in-demand as a babysitter. Her first babysitting job comes out of Ned Flanders’ desperation, and she succeeds both because she is responsible and because Rod and Todd are so frightened of life that she need only handle moth attacks swiftly to win them over. The subsequent montage of Lisa babysitting for the Wiggums and the Hibberts moves quickly, and glosses over awkwardness like Lisa babysitting her former crush in Ralph, but the typically swift first act does not gloss over the fact that Lisa needed to prove herself before her responsibility could be tested by her own brother. At that point the episode shifts into overdrive, testing Lisa’s responsibility in more absurd ways. Bart’s deployment of every trick in the book—prank ordering food, prank ordering an entertainer, calling in multiple fake emergencies, purporting to have the Ambassador of Ghana at the residence—creates the crux of the conflict, but I appreciate that it begins and ends with more basic rebellions. It starts with Bart’s refusal to eat his dinner, one of the most common babysitting challenges that becomes even more difficult when your older brother is out to get you, and it ends with Bart refusing to go to bed. There’s Maggie’s coffee ice cream rampage thrown in as an extra variable, but the episode doesn’t allow Bart’s pranks to serve as the sole catalyst for concern: “Go to bread” is far and away the most memorable line of this episode for me, and it’s also one that totally sounds like something a real kid like Bart would say to their babysitting sibling in a situation like this one. Everything goes off the rails at that point: Lisa’s attempts to get Bart to go to bed lead to the fall down the stairs, and the dislocated arm, and Lisa’s night shifts into how she can still be responsible about her lapse in responsibility without ruining her reputation for responsibility. 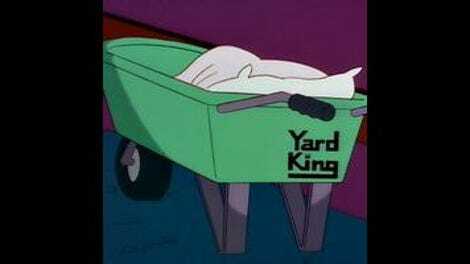 That it results in Bart in a wheelbarrow and Maggie in a cat carrier is, well, television—the episode transforms into a brief tour of Springfield’s medical underbelly (the wheelbarrow line’s over there, little lady), after which Lisa accidentally stumbles into the very sort of public disrepute she was so desperately trying to avoid as the entire town sees Dr. Hibbert diagnose Bart’s injury as the result of bad babsysitting. While Lisa’s nightmare scenario of Dr. Hibbert diagnosing Bart as she sits under the spotlight seemed fantastical, it’s more or less recreated in Springfield Harbor, bringing Lisa’s terrible, no-good babysitting gig to a close. It’s a strong Lisa episode in general, testing the character in ways that show her becoming more frazzled than we’re used to. I love the way her hair starts to show the impact of the chaos, losing its shape and pushing her further into exhaustion. I also appreciate how disturbing Bart’s arm is when it’s just hanging there—it’s an ugly fall, and the episode doesn’t exactly shy away from the visceral nature of his injury. This story isn’t just about characters going through scenarios—they’re transformed in the process, active participants down to Maggie’s excited wave from the cat carrier as the city looks on in horror. But it’s the episode’s coda that really solidifies the episode’s strengths for me. We don’t end this story on that night: we end it the next day, when Bart has his cast and Lisa’s lamenting the end of her babysitting career. First, it’s refreshing to see Bart straight-up apologize: he realizes he was out of line, and that—while true to his character—his actions took on a different context when aimed at his sister instead of at Grandpa or Patty and Selma. It’s a reflection that the events of the previous night weren’t just swept under the rug, and Bart’s cast is not the only “change” that would result from said events. Moreover, I appreciate that it’s also not made into so huge a deal that it entirely derails Lisa’s babysitting career: Dr. Hibbert still has judo to get to, and the Flanders decide that nearly killing her brother isn’t enough to outweigh their needs for a night out to help mend the whole “Maude getting kidnapped in a foreign country” situation. In other words, not only does life have consequences, but it also goes on—while The Simpsons may not be serialized, its best episodes are often those that feel like the stories within are built on things that happened before and lead to things that happen after, even if we never see those stories unfold onscreen. On the commentary track during this scene, Weinstein’s daughter Molly tells a story about how there’s a boy named Alex in her class—actually, there’s a boy and a girl named Alex, but that’s less important—who has a cast, and it’s a great moment where you realize that the sum result of this story is something totally innocuous. Kids get casts; not all of them are from babysitting mishaps and falls down stairs, mind you, but every kid is a playground injury away from having plaster around their arm. 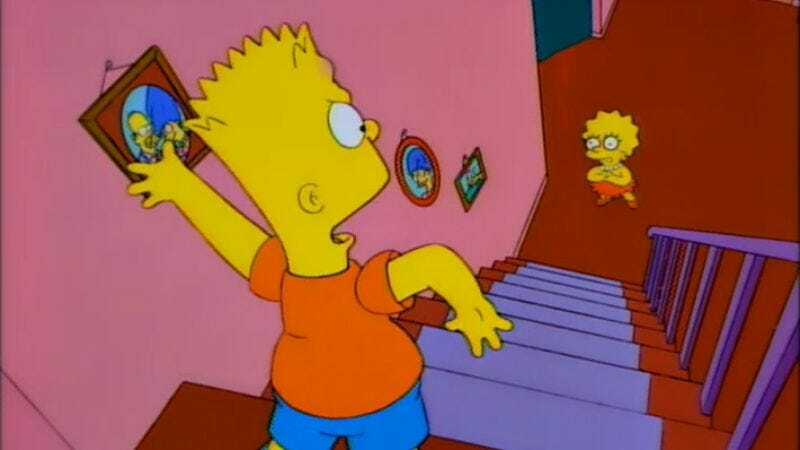 The way Molly reacts to Bart’s arm is a reminder that while there are undoubtedly jokes in kid-focused episodes that will go over the heads of young viewers, there are also experiences and consequences that resonate with those who are more Bart and Lisa than Homer and Marge. For those young viewers, I imagine the Homer and Marge storyline here has little impact, although it doesn’t have much anyway. Indeed, it’s a refreshingly simple setup, effectively an excuse to make a bunch of new store puns through the Springfield Squidport and giving the kids a party to crash at the end of their journey in search of medical attention. Marge and Homer don’t even have any conversations with people: they walk by stores, Homer gets stuck in the fountain, and the episode lets the forward momentum come exclusively from Lisa’s babysitting adventure. While this is not one of the season’s more emotional episodes, “My Sister, My Sitter” nonetheless reflects Oakley and Weinstein’s investment in the human side of The Simpsons during their years as showrunners. It is an episode that—outside of creating a black tie gala to get Homer and Marge out of the house—does nothing more than put its characters in a new, more-or-less ordinary situation to test their mettle, letting the jokes and the story flow naturally from a simple sibling starting point. Between “go to bread” and “It’s Bob Seger—aw, crap,” I feel that this has to be among the Simpsons episodes I quote the most often, even if I don’t necessarily feel that it’s one I’ve rewatched as much as others. On that note, rewatching reminded me that I really need to buy a wheelbarrow so I have more opportunities to work “That is a quality barrow” into casual conversation. And on the subject of Seger/Saget, that joke predates the point where Saget started to do projects like The Aristocrats that actually turned him into someone a Simpsons fan might want to see, a reputation I feel he did not have at this time. “Don’t laugh at me, I was once like you!”—Homer getting stuck in the fountain has almost no point, but it’s hilarious, and I almost appreciate that there’s no attempt to turn it into more of a punchline. He just gets stuck in the fountain, which is totally something Homer would do. I had a ladybug infestation in my apartment this fall, and I thought about Rod and Todd a lot as a result. There’s a lot of fun store names at the Squidport, but for some reason “Malaria Zone” is my favorite. I appreciate when even the commentary track seems confused, as they all were by Janey’s appearance as a convenient friend for Lisa to exposit her love of babysitting to (since they couldn’t make it Bart, as it would muddle his later outrage at the idea of it). Something about Quimby’s delivery on “WHAT THE HELL IS THAT” makes me laugh—it’s not even a joke, but the line reading totally sells it as one. I’m presuming that we’re supposed to read Smithers’ presence at Dr. Nick’s as tied to his closeted homosexuality, although that seems like a joke of its time in retrospect.